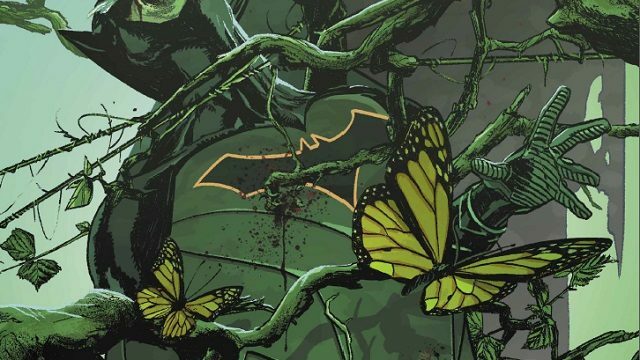 Despite Tom King's desire to genre hop and show off his obscure knowledge of the characters, Batman #23 still remains a good read for fans of Swamp Thing and the Dark Knight. Even though the Dark Knight already has more partners than common sense, it’s still fun to see him team up with other DC heroes. 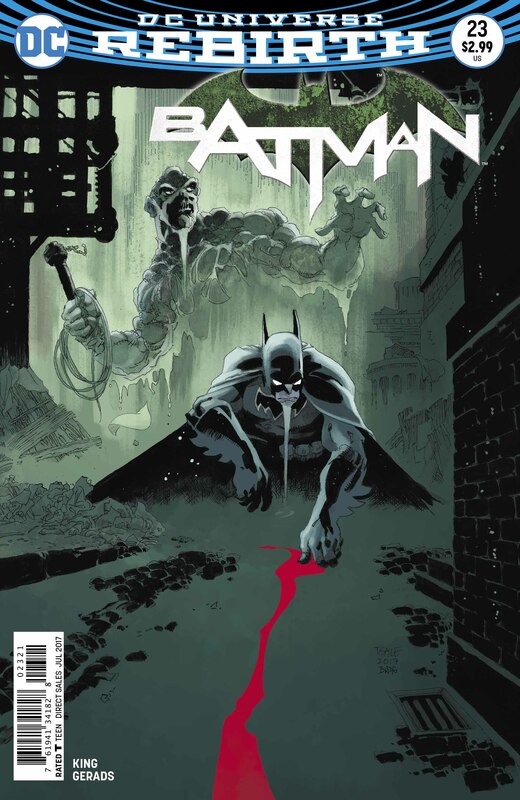 In Batman #23‘s pun-tastically titled “The Brave and the Mold,” Gotham’s silent protector joins forces with Swamp Thing to solve a deadly mystery. But is it any good? Well, c’mon, when the Caped Crusader and Alec Holland get together, you know that it’s only going to rule. First off, the premise of this adventure is perfect for a one-shot. Split into eight mini chapters, the two heroes pair up to find out who murdered Lloyd McGinn, who’s revealed to be Swamp Thing’s father. Sounds like a simple enough whodunit, right? 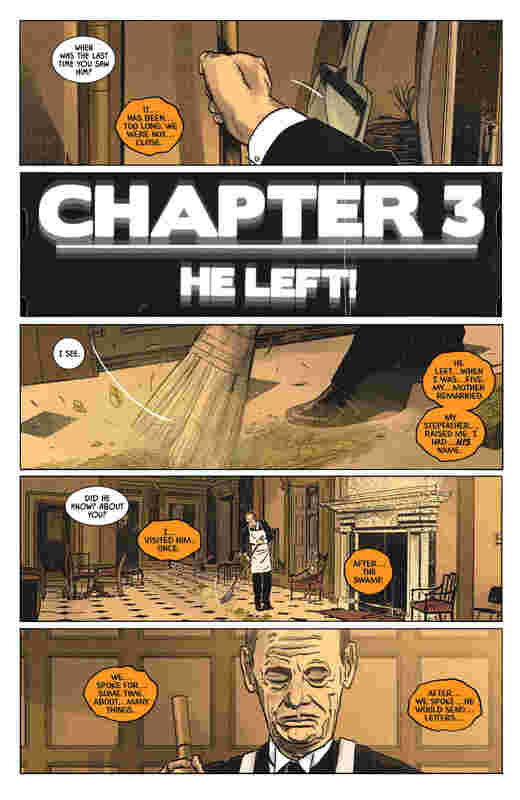 Well, this is a Tom King story, so you know that he’ll never do anything straightforward and easy. He sends us on a merry-go-round of emotions and sleuthing before he brings it all back home, leaving us pondering about the meaning of life and death well after the last page. For all the existential junkies out there, this issue whets your philosophical appetite like no other. Despite the bleakness and overall tone of the story, King manages to infuse it with a lofty amount of humor. 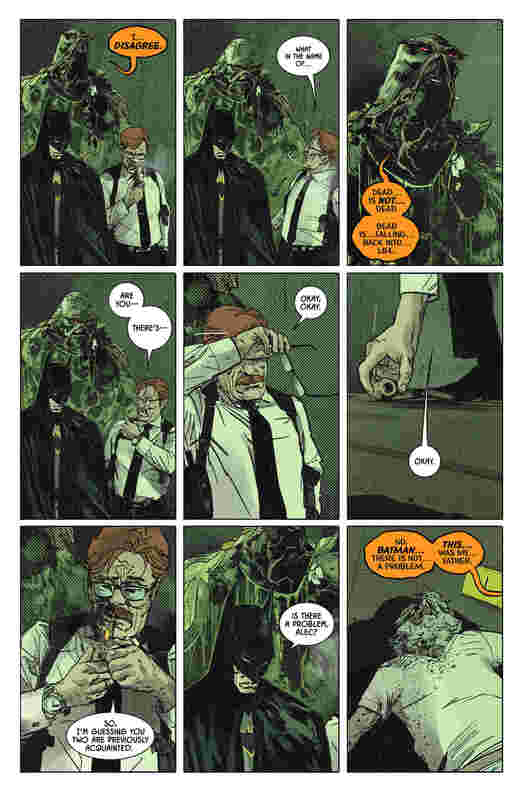 The car joke and Alfred’s OCD behavior around Swamp Thing, in particular, are two standout moments. That said, this tonal decision might not sit well with every reader. We’ve all seen how King loves to genre hop in his books, and how it alienates a lot of people who aren’t always sure what he’s trying to achieve. The same holds true here. Another problem is, King assumes the reader has as much Batman and Swamp Thing knowledge as he does. Looking at this issue as if I were an average reader of DC Comics, his use of homage and references is often elitist to the point that only the longtime diehards and fans will understand the in-jokes and allusions. You know who else does this and gets a lot of stick for it? Zack Snyder. At the end of the day, the purpose of a comic book should be about painting an entertaining story for all the audiences, not using the platform to show off how much you know about a topic. It comes across as pretentious here – something that the comic book community has been accused of being far too often. 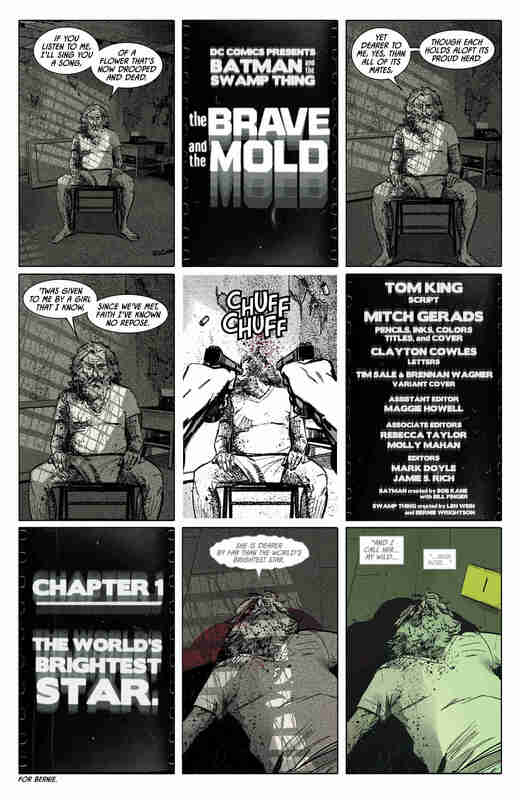 Mitch Gerads takes on the massive task of penciling, inking, coloring and doing the cover for “The Brave and the Mold.” It’s a crazy ask and you might even excuse him for neglecting one aspect of the artwork, but he knocked it out of the park in some style here. This is a stunning issue that speaks wonders of his talents. In fact, you’ll struggle to find a more beautiful comic book to read this week than this one. 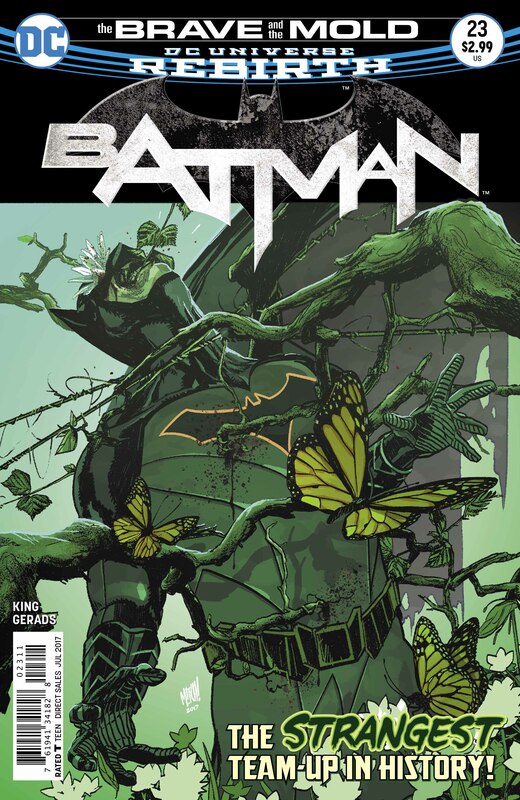 In spite of my criticism of King’s storytelling choices, Batman #23 is a respectable issue for fans of both the Bat and Swamp Thing. 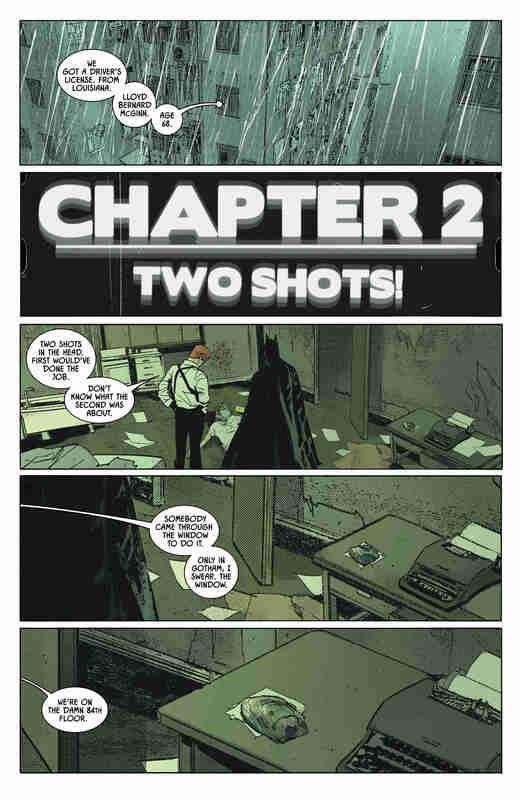 It works as a nice breather after “The Button” and a perfect primer for the next phase of Batman stories.